After a 1-1 draw in the first leg, it was advantage Valencia, due to the away goal. 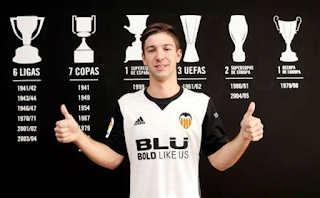 Nonetheless, the team didn't take it easy, producing one of their best performances in a while to continue a good start to this year, with Vietto the second Valencia player this season to score a hat-trick. 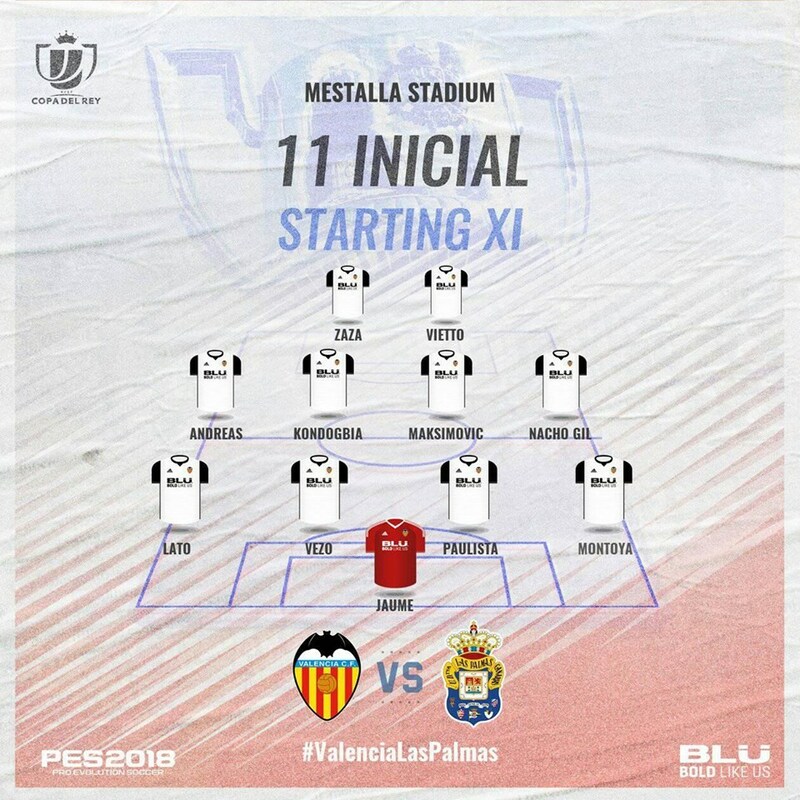 giving a first start to Vietto, with players such as Neto, Garay, Parejo, Rodrigo and Guedes rested. 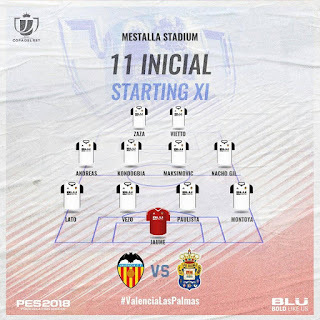 Las Palmas in contrast went for almost full rotation, changing 9 players, clearly making a strategic decision to focus on league survival rather than the cup. More often than not, Valencia get going more in the second half. This wasn't the case here as we had an excellent first half, controlling the game, creating numerous chances and unlucky not to be several goals ahead. Pereira cut inside the 6th minute and his pull back was shot wide by Gil. In the 16th minute, Kondogbia made a good recovery in the centre and his ball forward eventually landed at Vietto, who powered a shot just over. Minutes later, Zaza showing his quality, recovering the ball, holding it up then finding an intelligent run by Gil, who was unable to beat the keeper one on one. 20th minute, Lato's cross found Zaza who sent it just wide. Valencia had started brilliantly, doing everything except score. The nerves were calmed a bit in the 29th minute, with a counter-attack featuring Gil, Vietto and Zaza, ending with Zaza's attempted diving header being rifled into the roof of the net by Vietto for a deserved lead. Las Palmas pushed forward a bit more after that, but Kondogbia and Maksimovic did a good job of covering the defence, while Vezo marked Calleri out of the game, with the latter forced to push Vezo over just before half time to get the ball in the net. Rightly disallowed. Any disappointments at the lack of goals in the first period were soon put to rest. Pereira linked up well on the right and his centre was met with a good first touch from Vietto who lifted it over the keeper for his second goal. Nacho Gil was unlucky to get a third, as he had been all game. Instead it was Maksimovic who got it, scoring his first goal for the club and a super one too, a screamer from outside the area. Unluckily for him, it would be overshadowed by an even better goal. The Las Palmas keeper had come out to intercept Zaza, but was still rushing back when Vietto lobbed him from the centre circle for a memorable hat-trick which showcased all his skills. A goal that rivals Guedes' first goal against Sevilla for goal of the season. Las Palmas were well beaten and their efforts after that came to nothing, with Valencia looking the more likely to score. Las Palmas may not have been at their best, but Valencia certainly were. A very solid performance which continues a good week, as R.Madrid and our more likely rivals Sevilla and Villarreal all slipped up last weekend. Marcelino said that if we keep winning we'll finish top four. Play like this and that won't be in doubt. Maksimovic 7.5 - got a chance to show what he could do and take it, scoring a great goal, deserves more minutes and with Kondogbia suspended for the next game, should get them. Pereira 7 - good game but..... could do with being less selfish. That said, always an attacking threat and good assist for the second goal. Zaza 8 - was really back to his best. Unlucky not to get on the score sheet but did everything besides that, even popping up in defence a couple of times at the end. 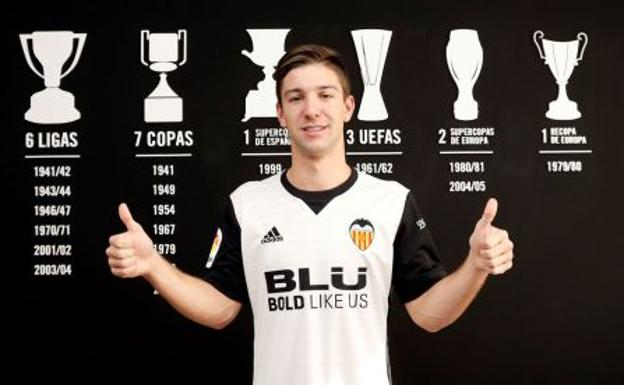 Vietto 10 - as I mentioned in a previous post, he's been on our radar for nearly 4 years and so far has proved worth the wait. Will be starter if he keeps this up. Parejo 7 - I'd have let him rest for the league, but this was a comfortable and confident performance as usual.